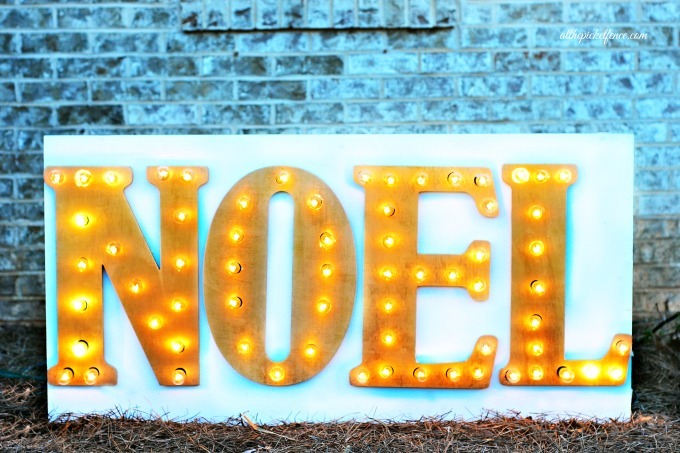 Today I, along with the Command Brand, am sharing a super cool outdoor holiday project! I have been so busy getting the INSIDE decorated, that I must confess I had been a little neglectful of the outside! 2. 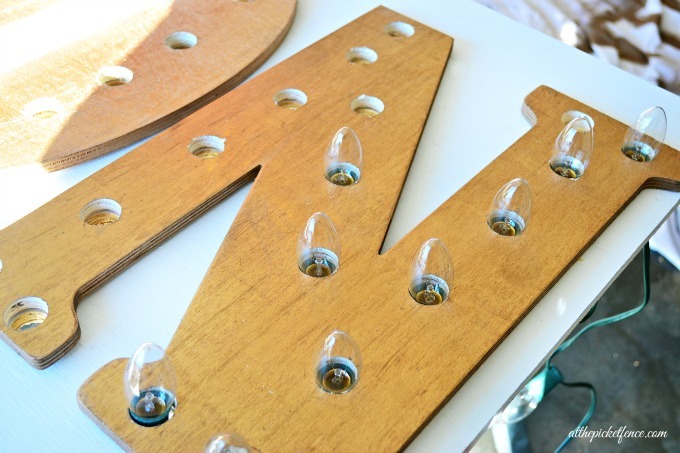 Paint letters with gold spray paint and allow to dry thoroughly. 3. Arrange letters on plywood and measure to make sure they are centered and even. 4. 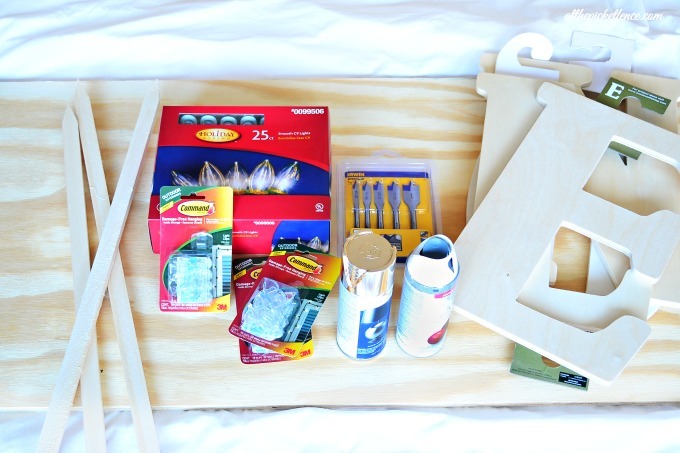 Nail letters to plywood using nail gun and brads or small finishing nails and hammer. 5. 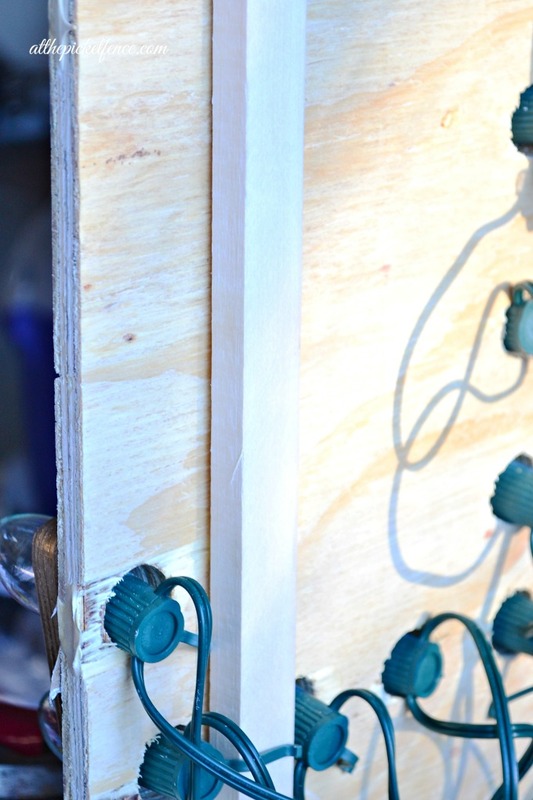 Measure and mark out where you will drill your holes for lights. I spaced mine 2 1/2-3 inches apart. 5. Using firm pressure drill holes on marked locations. Step back and make sure holes are lined up and even. 6. Use a shop vac, if you have one, while working to keep letters and work space free of sawdust for easy clean up. 7. Once you have your holes drilled and your work space cleaned up, begin to thread lights through holes. You will need to remove each bulb and push base up through hole, and place bulb back in base. Start at the top and work your way across your sign so that you end with your plug at the base of sign to attach to extension cord. 8. Once you have all of your lights placed, turn your sign over to arrange cords neatly along back of sign using the Command Outdoor Light Clips. The Command OUTDOOR Light Clips work great for outdoor lighting projects because they hold strongly in temperatures from -20°F to 125°F! They also are provide damage free hanging and remove cleanly when you are finished with them. 9. Place your Command light clips along the back of your sign, where you will gather up the light cords neatly, and allow the clips to set for one hour. 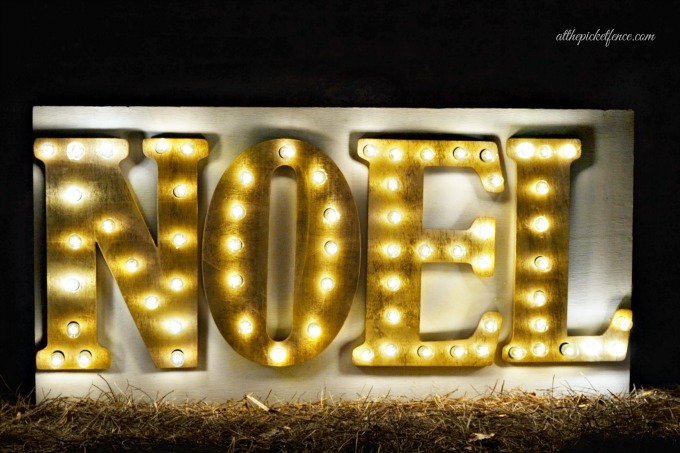 Run clips along the bottom of your sign for excess lights and cords. This will keep them protected and off of the ground. If you need to reposition a clip, it’s super easy! Just pull the strip straight down and the clip will pop cleanly off. You can use a new strip and reuse the clip in the proper location. 10. For the final step, using your nail gun or finishing nails and a hammer attach stakes to the back of the sign, lining the top up evenly with the sign. Place your sign in your yard and hammer stakes into ground to properly secure your sign. Plug lights into a outdoor approved extension cord and watch your sign glow! Be sure to see this video from John Storms, holiday lights display expert, for more fabulous ways to use Outdoor Command Strip Products in your holiday decorating! And we invite you to follow the Command Brand on Facebook, Pinterest, Twitter and YouTube for great ideas and projects using Command products! Are you all ready for the holidays? 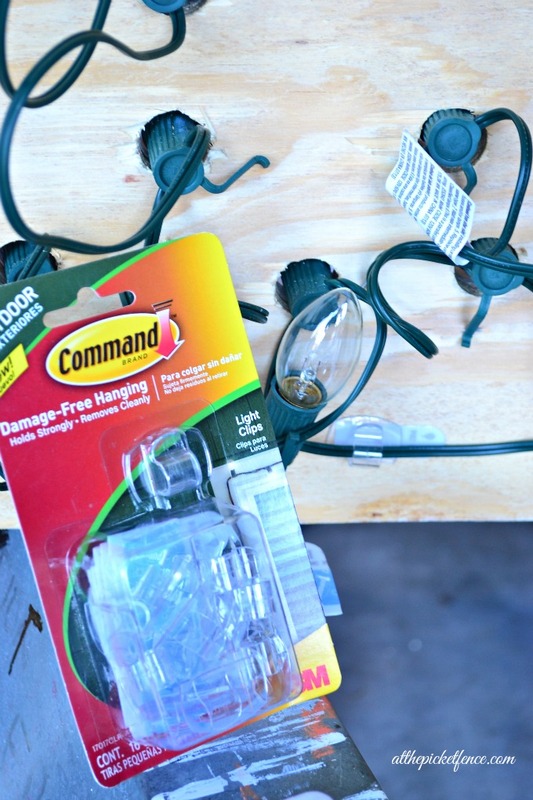 If you still have some last minute outdoor decorating to do, be sure to grab you some of the Command Outdoor Products for easy and #damagefreeDIY ! I was provide product and composition from Command Brands for this project and post, but all opinions and ideas are my own. Please see our full disclosure policy for more information. 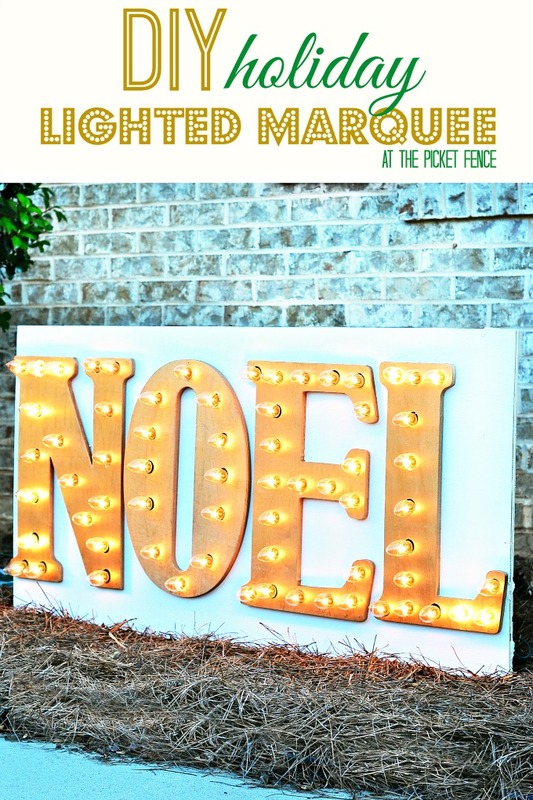 24 Comments on "Outdoor DIY Marquee Sign for the Holidays! 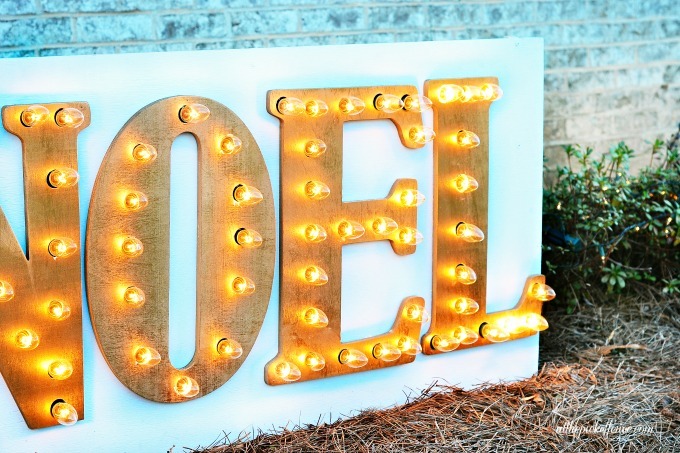 #damagefreeDIY"
oh I love that you made the marquee sign for outside!! that would be fabulous for parties too!! It would be great for parties and even for a kid’s bedroom, my daughter is talking me into making her one for her room! 🙂 Thanks for stopping by Cheryl! I think I just need to head down your way and help you make one. 😉 Thanks for stopping by Lucy! I didn’t realize that Command had Outdoor hooks too! WOW!! This opens up so many new frontiers! Thank you so much for sharing. Your sign is wonderful!! Where did you find those 18″ letters? Love, LOVE those!! Happy Holidays! Hi Jennifer, The letters are from Hobby Lobby, they are huge! I love them. Happy Holidays to you! This is such a fun project! You go girl! I am totally pinning to make for next year! Merry, merry Christmas to you sweet friend! Thank you! Merry Christmas to you my dear friend! I am crazy over this with the big, old fashioned lights….I want one for our New Year’s Eve party! Thanks for sharing that great video, too! Wishing you and Vanessa a wonderful celebration this year……Happy Holidays! It would be fabulous for New Year’s Eve! Great idea! Thanks for stopping by and Happy Holidays to you! Nice project that can be customized for a variety of styles. Thanks for the post. What an amazing idea…and it could be used for many other occasions! Have a very Merry Christmas at the picket fence! That’s so fabulous! I’d love to have that in my front yard! Great use of those clips … we really need to get some of those and do some outdoor decorating. I love this. I know my hubby won’t nix this idea and I might have a shot at getting his help. It isn’t too girly…it stores fairly flat…some work but should last for years…statement piece for those who want to declare their faith with a word like Savior. My question is…how would you suggest decorating with it. Not sure if I want it just propped up against a tree. Any suggestions?